Turret for 12 samples. It permitscontinuous measurements of samples up to 32 mm in diameter. It improves throughput, especially for measurements in a vacuum or helium atmosphere. (Outer diameter: 31.6 mm, volume: 10 mL) Polyethylene sample cell for liquid and powder samples. (Outer diameter: 32 mm, volume: 8 mL) For liquid samples. Equipped with a relief hole and liquid retainer in case of liquid expansion. (Outer diameter: 31.6 mm, volume: 0.5 mL) For trace samples. Recommended for use with a collimator. (Outer diameter: 31.6 mm, volume: 8 mL) For liquid and thin-film samples. Equipped with a relief hole and liquid retainer in case of liquid expansion. Equipped with a ring to tightly hold thin-film samples with film. *3 Microsoft Office is not included. 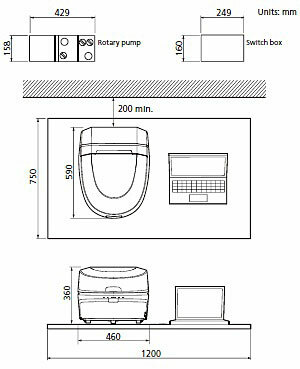 Vacuum measurement unit (optional) consists of a control switch box and rotary pump.